Homelement officially incorporates their very own home decor blog to the site. The blog, used to be known as Online Furniture Design, has been officially moved as an integral part of Homelement site. This is not a typical store blogs which are actively pushing products to sell. We are really trying to provide useful home decorating ideas and tips to our customers and readers. Homelement officially incorporates their very own home decor blog to the site. 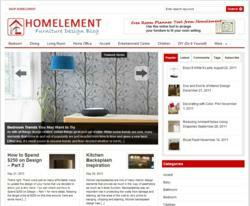 The blog, used to be known as Online Furniture Design, has been officially moved as an integral part of Homelement site. The transfer has been completed late last year but has not officially been announced due to the change of direction of the blog in the recent months. The home decor blog used to contain specific product reviews and shorter articles but in the recent months, it has expanded the articles to contain more general home design and improvement articles in greater details. This change was initiated based on the feedback of the readers and so far, it has been very well received and proves to reach a greater audience. "This is not a typical store blogs which are actively pushing products to sell. The articles might have mentioned certain products from our store from time to time but you can tell that it is not the main focus of the blog. We are really trying to provide useful home decorating ideas and tips to our customers and readers." The home decor blog contains hundreds of articles and covers everything from general home decorating ideas, latest home design tips, DIY projects, to specific improvement room improvement from bedroom decorating ideas, dining room decorating ideas, and many more. Homelement.com is a leading retail supplier of home furnishings with more than a dozen years of industry experience. Homelement home decor blog covers general home decorating ideas, latest home design tips, DIY projects, as well as tips for specific room improvement from bedroom decorating ideas, dining room decorating ideas, and more.